Ingmar Bergman is one of those artists who took some time to bloom. His early career is populated with a string of films that weren't successful financially, and which show a director struggling to find his voice. Made in 1953, Sawdust and Tinsel is his thirteenth film, and it precedes his breakout feature, Smiles of a Summer Night, by two years. Even so, in the video introduction he recorded for Sawdust in 2003, Bergman calls it the first good movie he made, despite a tepid response from critics and audiences. To take it further, I'd daresay that Sawdust and Tinsel, released on DVD for the first time by the Criterion Collection, has more in common with his late '50s masterworks like The Seventh Seal and The Virgin Spring than Smiles does. In this early Bergman motion picture, we can begin to see the complicated emotional drama and penchant for off-kilter imagery that would define much of the Swedish filmmaker's work. The film opens as a ragtag circus makes its way across the European countryside early in the morning. Cold, battered, and quiet, this caravan shows little of the fun and frolicking that is usually associated with circuses. The ringmaster, Albert (Ake Grönberg), goes and sits with the driver of the lead wagon, and the horseman reflects on a story from seven years before, when the troupe's pasty-faced clown Frost (Anders Ek) caught his wife Alma (Gudrun Brost) swimming naked with a bunch of soldiers who paid her to strip for them. Encouraged by the others to be a man and take back what is his, Frost doesn't have the cajones to stand up to the soldiers. The best he can do is swim out and bring his wife to shore. The laughter of the crowd strikes him as if riddled by bullets, and the poor clown--a stand-in for the common everyman, it could be any of us under that make-up--collapses. Instead of carrying his wife back to camp, she has to carry him. This early anecdote serves two purposes: it shows the dark cloud that hangs over Albert's circus troupe and acts as an indicator for how Bergman is using performance and spectacle purposefully. For this interlude, he and cinematographer Sven Nykvist give the story an old-time look and feel. The whites are blown-out, and the heavily pantomimed action runs mostly without dialogue, the only audio being music, like a silent film. It's as if Bergman is backtracking. He is making a modern film, but by using old film styles, he takes one step back, taking us along with him toward even older performance arenas, the circus and the traditional stage. Once the circus gets to town, Bergman puts together a multifaceted social drama, the structural complexity of which, as well as the focus on infidelity, makes it a darker cousin to Smiles of a Summer Night. Who wants to be with whom, and whom will they sleep with instead? The current stop happens to be the town where Albert left his family, and he intends to go see his wife (Annika Tretow) and two sons for the first time in three years. This makes his current lover, the Spanish horse rider Anne (a buxom Harriet Andersson), feel insecure. Deciding this is her time to get out of the circus life, she goes into town thinking that a lothario actor (Hasse Ekman) will take her in. It's not a bad instinct, because Albert is also trying to jump from the caravan and settle back down at home. Both of them are dreaming larger than they are capable of. Here, though, is where Albert's story crosses with Frost's. Realizing that Anne has cheated on him, and denied by a wife whose financial security depends on Albert staying out of her life, his very manhood is called into question. Will he just drop down and take it like Frost, or is Albert capable of more? 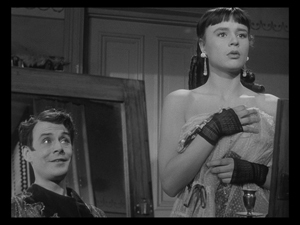 Sawdust and Tinsel in a lot of ways feels more like fodder for Federico Fellini than it does Ingmar Bergman. The Italian director loved looking backstage and showing the lives of performers. One mustn't forget, however, that Bergman has written and directed stage plays his entire career, even after he retired from film, and he wrote about actors even as late as Fanny and Alexander. At this stage in Fellini's filmography, he would have been more fascinated with the female performers than even Bergman was. Though Bergman calls attention to the thin line between performing for the pleasure of others and prostitution, and the humiliations women often suffer, Sawdust and Tinsel is more in tune with the male cuckolds. The men are at various times framed in mirrors, either searching for or revealing their true nature in the glass. There is a split between Albert, who can barely face himself, and the actor, Frans, who isn't afraid of the things he so deviously hides. In a similar vein, Bergman also uses make-up as a metaphor. Both the circus performers and the actors wear make-up in their work. Frost uses heavy powder to completely obliterate any pretense to being socially functional, whereas Frans wields it as a weapon of seduction and deception. When he and Anne are alone, the phrase "war paint" takes on a whole new meaning. Frans notes how poorly Anne's make-up is applied and tells her that he can show her how to do it properly. The sexual threat of the scene is clear, the tension rising as Anne first submits to the treatment and then tries to get out of it. Adding further to the layers that separate these people is Bergman's clear delineation of the social strata that puts the circus at the bottom of the pack. The theatre people have a permanent place in town, but just as with everything else with the actors, it's a false placement. They can play the part of being respectable citizens, but they are wolves in sheep's clothing. Frans would make no more suitable a husband than Albert. Both types of performers are really just grist in the town's entertainment mill. The final act of Sawdust and Tinsel takes place entirely at the circus. It's the performance night and the morning-after tear down. 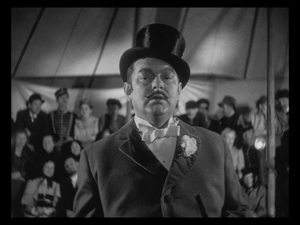 Under the big top, Albert is meant to be the master, and it's here that Bergman will lather on the irony and mete out his punishment. The tragic flailing of the ending is painful to watch--a reeling, impressionsitc battle of both body and will. When it comes down to it, the circus ring is its own circle of Hell, closed and unbending. Thus, it's fitting that the end of the film first shows Frost and Albert walking alone, men who see their position in this world all too clearly, bringing both a bitter resignation and one hope's a happy acceptance. Apparently the Sawdust and Tinsel - Criterion Collection DVD has five minutes restored to the movie that have not previously been in any U.S. release of the film (the scuffle with the police in town). In addition to that, it's obvious the movie got a lot of loving care on its way to disc. Shown in 1.33:1, the image quality is outstanding. Outside of a handful of frames with minor scratches on them, you'll be hard-pressed to find any issue with the beautiful black-and-white picture. Though full frame, the image is actually show in a "pictureboxed/windowboxed" format, meaning that there will be black bars on all four sides when viewed on a widescreen television. On standard square tubes, the picture will fill the entire screen. The soundtrack is in mono, in the original Swedish with English subtitles. The sound of the movie has a spooky atmosphere, with notable silences and a powerful musical score by Karl-Burger Blomdahl. Particularly the early flashback sequence has specific sound cues that border on the playful, and the sound quality on Sawdust and Tinsel - Criterion Collection preserves the effectiveness of this portion of the film. I didn't notice any hiss, odd tones, or stray noise. Very clean, very clear. 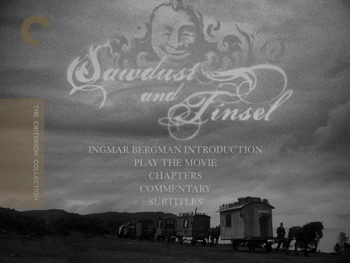 The audio commentary for Sawdust and Tinsel is by Peter Cowie, a regular contributor to the Ingmar Bergman discs from Criterion (among others). His tracks are always informative and scholarly, while also staying conversational. The 20-page accompanying booklet has cast and technical credits, a chapter list, and photos from the film alongside two critical essays about Sawdust and Tinsel: writer John Simon on the movie's place in Bergman's canon and Fat Girl director Catherine Breillat sharing her impressions of the movie. Highly Recommended. An early creative breakthrough for Ingmar Bergman, Sawdust and Tinsel would see the Swedish director using the metaphor of performers and performing to expose the depths of deceptions in relationships, manhood, and society itself. Following a run-down circus troupe to its latest stop, he creates a swirling social drama where two lovers seek escape but find only rejection. Layering in a side story about a clown's marital woes, a prior indiscretion that hangs over everything, the movie becomes a painful examination of the action men are expected to take and the way these things can go wrong.